My skin has not felt great recently, it’s been dull, sluggish and very dry. I know this is probably down to my age and what was a lazy beauty routine - a quick wash with a facial scrub and a slap of moisturizer. I’ve tried several products over the years, from expensive cleansing lotions to under eye creams, yet nothing that ticks all the boxes for me really works and I always end up resorting to something cheap and sadly, not ethical. But I want my beauty routine to be more sustainable, to use natural plant based ingredients and less packaging. I don’t want artificial fragrances and other nasties in things that I’m going to put on my skin. Looking a little deeper into what I use and why, I decided the answer was to start making my own. This is the first in what I hope will be a series of natural beauty DIYs and it’s a real cracker. Everything contained in it has a purpose, is completely natural and packaged in glass bottles for easy recycling. You only need a small amount of each ingredient, so buying all the supplies works out cheaper in the long run too. It is suitable for all skin types, but is particularly good for it’s anti-aging properties. My skin has never felt better and I honestly can’t believe how soft and smooth it is after only a few weeks of using it. I actually can’t stop stroking my face! This serum takes only a few minutes to make and you don’t need to do anything other than add a few ingredients to a bottle. It is ideal to use as a light moisturiser and you only need a tiny amount so it lasts for weeks. Rosehip oil takes centre stage for this serum and as it’s a dry oil, it absorbs into the skin quickly and doesn’t block pores. Organic Cold Pressed Rosehip oil - choosing organic means that the crop has been grown without pesticides, herbicides and it contains no harmful chemicals or parabens. The cold pressed extraction method means that the oil is at it’s most potent and ensures a high level of vitamin content. The best quality oils are yellowy-orange in colour (see picture above) but it goes on clear on your skin so you won’t be walking about looking like an Ooompa Loompa or Donald Trump. Rosehip oil helps to relieve dry skin and is a naturally anti-aging remedy. It’s rich in vitamin C, Omega 3 and Omega 6 fatty acids, both of which are known to brighten and tighten skin. Organic Sweet Almond oil - light base oil that absorbs easily into the skin and rich in vitamin E. It’s also known to help with dark under eye circles and nourishing dehrydrated skin. Carrot Seed oil - rich in antioxidants and contains vitamins C and E. Perfect for mature skin as it’s also a natural anti-aging remedy. Geranium Rose essential oil - this smells incredible and the oil has anti-inflammatory, antibacterial and antiseptic qualities. It also helps to combat wrinkles as it improves skin elasticity. Lavender essential oil - helps to regenerate skin cells and lightens the appearance of skin blemishes and age spots. Pour the rosehip oil into the amber glass bottle until it is about a third full. Pour the sweet almond oil into the amber glass bottle until it’s about two thirds full. Add one drop only of carrot seed oil. It’s very powerful stuff! Add six drops each of geranium rose and lavender essential oils. Shake gently and then you are good to go! ( Always do a skin test to check you haven’t any allergies to essential oils. I like to dab a little behind my ear and leave it for 48 hours to make sure the product doesn’t make my skin itch or break out in a rash. 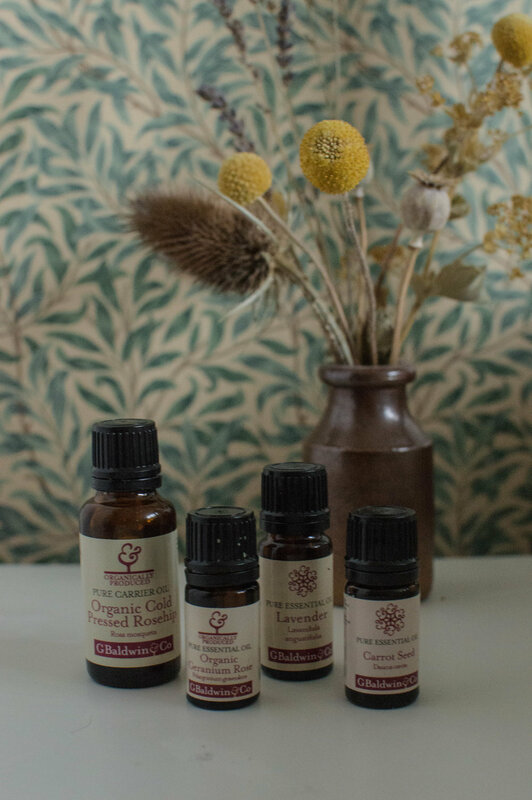 Speak to your midwife before using essential oils if you are pregnant and don’t use oils on your skin if you are breastfeeding).